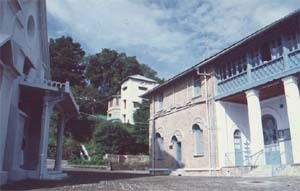 " St. Mary's Convent Nainital "
an English lady, in the 17th century, The sisters of the Congregation started working in Patna in 1853. The Superioress of the ( I.B.M.V. ) 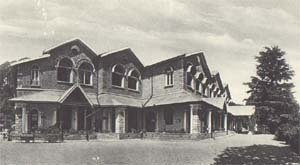 Convent Patna, Mother Salesia Reiner, planned a foundation in Nainital to help the sisters whose health had suffered hazardously from the heat of the plains. After over- coming initial difficulties in obtaining accommodation with trustful optimism, a team of 9 sisters started a school with a few day scholars in the month of May 1878. The persence of the sisters. By the close of 1878 the school had 40 boarders and a number of day-scholars. Today it numbers 1100 all in all. 300 boarders and 800 day-scholars. 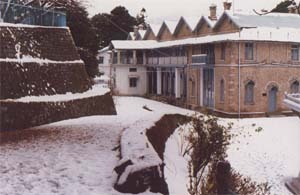 St. Mary's Convent Nainital is the third oldest school in Nainital and charmingly situated on a gently sloping hill with 26 acres of ground, admirably adapted for a boarding school. It is affiliated to the Inter-State Board of Anglo-Indian Education and works for the education of girls. As a Catholic School special preference will be given to Catholic girls. 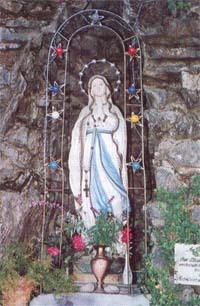 The school strives to develop God - fearing and patriotic citizens imbued with a sense of justice and charity, which mainfests itself in the exercise of spiritual and moral development for their all-round personal growth and social responsibility to the needs of others and to the local and national environments. The Sisters of the Institute of the BLESSED VIRGIN-MARY (I. B. M. V.) conduct several schools and colleges in India. The Institute was founded in 1609 by Mary Ward, a valiant English on moral and spiritual fromation, in response to the needs of the times. Our Schools and Colleges strive to prepare our students to be responsible, mature and integated personalities. We aim at developing in our students an awareness of God's love, care and concern, through which they may find a meaning in life and a good hope for the future. We seek to from thoroughly educated persons, who motivated by genuine love and spirit of service, are alive to the needs of our times. Along with secular knowledge, we strive to instill in our students, strong personal convictions and right values to motivate their action. To achieve this we seek to form in them a right conscience in their relations to God and their fellow - men, with a thirst for truth, a sense of social justice, genuine concern for others and obedience to lawful authority.